Sitting is being called the new smoking. The National Health and Nutrition Examination Surveys report that 50-70% of people spend six or more hours sitting per day. An inactive lifestyle is shown to shorten your lifespan, cause hormonal changes, and increase inflammation. Sitting dormant for hours on end combined with a lack of exercise has been proven to cause type two diabetes, heart disease, and certain cancers. 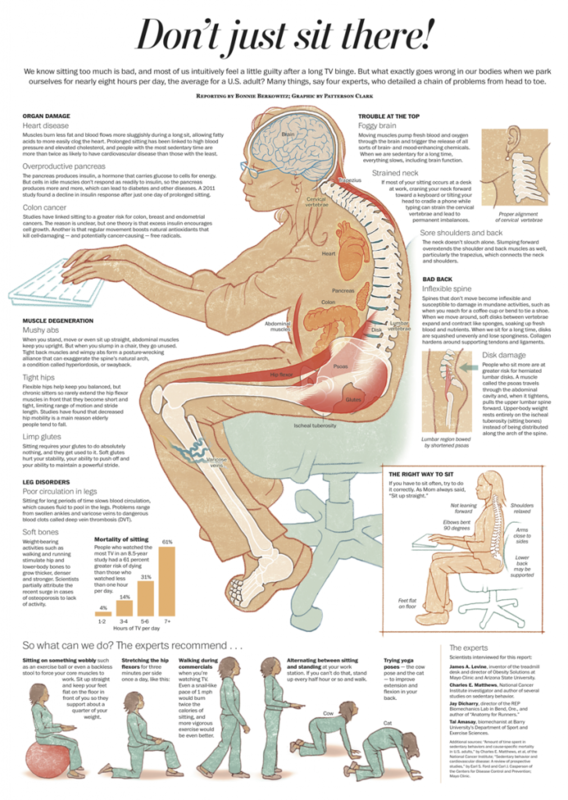 Here are some of the main health complications that are associated with the “sitting disease” and some simple solutions to prevent and combat its negative side effects. Stand Up– Get up and stretch every 20-30 minutes (set a timer if needed). 20 minutes of standing per hour is recommended. Practice Chair Yoga– Watch a youtube video on chair yoga and practice at your desk. Even 5-15 minutes is of benefit. Ergonomics for Your Workspace– Make sure you are seated the proper distance from your desk with your elbows and knees at a 90 degree angle with feet flat on the floor. Your chair should compensate for the natural curvature of the lumbar spine. If your chair has a vertical back you can roll up a towel to support your low back. There are some other great desk setups such as using a stability ball as a chair or changing from a sitting desk to a standing one. Practice “Cobra” Asanas– These are amazing yoga postures to help strengthen the low back. Most of them include lying on your belly and lifting up your head, neck, and spine with the strength of your back muscles. Sun Gazing– This one has been confirmed by NASA to cure certain diseases and also increase super-human abilities such as telepathy and being able to go without food! You only need 10 seconds (to start) of staring at the sun within one hour of sunrise and sunset to help energize your eyes. Eye Yoga– These exercises are to essentially stretch and moisten your eyes. Techniques include looking at the tip of your nose, moving your eyes in a “figure 8” pattern, in giant circles and blinking repeatedly to lubricate your eyes. Eye Palming– Simply put the cupped palms of your hands over your eyes to shut out the light and breathe. People have reported clearer vision and reduction of dry eyes and headaches from this simple technique. Netra (Eye Basti)– Ayurveda has used this oil eye bath for many health benefits including improved vision, combating migraines and eyestrain, and slowing the natural degeneration of the eyes. Warm 1/4 cup of ghee (clarified butter) and let cool around room temperature. Place the ghee in an eye cup (you can find at drug stores) and tilt your head down while placing the eye cup over your eye. Then move your head back and let the ghee bathe your eye (while open and moving around) for about 5-7 minutes. Repeat on other eye. Wrist and Arm Stretches– These should be done throughout the day, especially if you are heavy on the keyboard and mouse. Stretching and flexing all the joints of your fingers, wrists, and arms can relieve built up tension. Topical Remedies– Studies have shown a great reduction in pain for those who used arnica topically after wrist surgery. Turmeric is used for pain and inflammation. Use topically on your wrist and can also taken internally. Castor Oil is used as an Ayurvedic remedy for arthritis and joint health. Apply liberally at night and throughout the day. Massage– Oil your wrists and forearms and gently squeeze starting from your palm and wrist and ending at your elbow. Neck Press– Stand with your back to a wall and lift up through your crown, tuck your chin to your chest, and press the back of your head and neck against the wall. Press for 10 seconds than release for 5 seconds. Repeat for 5-10 reps. Neck and Shoulder Circles- Move slowly and explore range of motion. Progressive Relaxation- Squeeze your shoulders tight up to your neck- hold for 10 seconds- than drop your arms down and release all tension. Repeat as needed. Hold Your Phone- Instead of using your shoulder, hold your phone in your hand or get and ear piece. This “sunshine vitamin” can be seriously lacking in IT professionals and those who are indoors for most of the day. Our bodies produce about 20,000 units of Vitamin D per approximately 20 minutes of sun exposure. That’s more than 100 times the recommended dose of Vitamin D by the U.S. government! It is also said to be virtually impossible to get the adequate amount of Vitamin D from food alone. Get Outside-Take short breaks to get outside for some fresh air and let the sunlight hit your skin. Eat Foods Rich in Vitamin D- Portabella, shitake, and white mushrooms along with almond milk are all good vegetarian sources of Vitamin D.
Walk More Than 30 Minutes a Day- Studies have shown that walking just 30 minutes a day will cut the chance of dementia, depression, anxiety, diabetes, high blood pressure, cardiovascular disease, and osteoporosis by at least 40 percent! Move Your Body (Every Little Bit Helps)– If biking or walking to work isn’t possible, park in a space away from your work to get some extra steps in. Take the stairs instead of elevator, walk in place while talking on the phone, and make up your own tricks to get your body in motion. Sitting while we are at work is only half the story. It’s what we do both during work and for the rest of the 24 hours that can be crucial in preventing illness. Plan to spend your days off outdoors with a hike or biking trip. If you absolutely must catch your favorite T.V. show after work, stand and do some simple stretches during commercials. If video games is your thing, get a kinect or wii (full body devices that allow you to move while playing). There are some interesting ideas popping up worldwide to help with our sitting problem. Cubii is a small scale elliptical device that fits under your desk- so you are not completely sedentary while at work. There is even a bracelete called the Pavlok that sends a low-current electric shock to your wrist if you don’t meet your fitness goals. If self-imposed mild torture is not your thing, you can also use post-it notes and set reminders on your phone or computer. More and more businesses are offering yoga classes and incentives for getting healthy and fit. Get creative, know what works to get you motivated and create a plan that you know you can follow through with.